The API outsourced manufacturing market is predicted to reach US$101 billion by 2027 out of a total market of US$157 billion, with the fastest growing sector being HPAPI, driven by increased demand for cytotoxic APIs. By the end of 2024, the cancer segment is projected to reach close to US$100 billion in value, expanding at a CAGR of 6.5 per cent. This is fueling the growth of the biotech HPAPI segment which is predicted to be the fastest growing due to the rising demand for cancer drugs and is in turn driving research and development activities pertaining to it. In addition, rising usage of HPAPI in gynecology and cosmetics are accounting for further growth. This all leads to a much higher demand for more advanced control strategies in facilities where HPAPIs are being manufactured to ensure both the quality of final products and, critically, operator safety is properly achieved. There has been much documented on market diversification in recent years for example, the onset of technologies including isolators and Restricted Access Barrier Systems (RABS) which are frequently used to safeguard products and operators throughout the manufacturing process. However, closed transfers, for example split butterfly valves (SBVs), are growing in demand due to benefits such as the reduced need for operator intervention. This limits the risk of cross contamination as well as the presence of airborne dust particles, in turn increasing operator safety. However, as with all containment equipment, it should be qualified in accordance with the International Society for Pharmaceutical Engineering’s (ISPE) SMEPAC (Standardized Measurement of Equipment Particulate Airborne Concentration) guideline before its use within the process. But with so many factors up for interpretation, what should manufacturers be looking out for during this testing? ISPE SMEPAC addresses a broad selection of containment technologies and processing equipment, providing technical guidance and consistent methodologies for evaluating the particulate containment performance of pharma equipment and systems. It is only intended as a guide, demonstrating how the containment device will perform as part of a laboratory condition test, not in a particular process in a real-world manufacturing environment. So why is it important? The guide aims to define current good practices, providing information to allow organizations to benchmark their practices and improve on them. Specifically, the guide provides a methodology to derive data associated with handling of pharmaceutical ingredients that is useful in the assessment of potential risks. When qualifying containment equipment, occupational health professionals focused heavily on worker exposure measurement as the primary target during the late 1990s. The method was formalized as SMEPAC shortly after and later adopted and revised by the ISPE. It is now widely welcomed and implemented by the industry. However, the nature of this guidance on sampling methods and distribution makes it difficult to compare results between technologies. The data lacks statistical rationale and more importantly, the method would be better suited if it provided a baseline dataset for future integrity testing. There are many factors that can affect the interpretation of the SMEPAC test results, including the testing procedures, test equipment, the placebo and the statistical analysis. If we examine the testing procedure first as detailed by SMEPAC, it allows for a certain amount of variation. For example, referring to transfer measurement, the SMEPAC guideline notes that ‘the masses’ are mostly meant to completely coat the unprotected seal and operational area. However, by suggesting a range of weights, this surely means that the variation in volumes may result in data that is inconsistent? Furthermore, there is considerable differences in results from the use of various samplers, when sampling with the very same placebo under the identical test conditions. In addition, there are varying types, particle sizes and detection levels of placebos too that the SMEPAC guide recommends. Lactose, paracetamol, mannitol and naproxen are recommended suggestions and it’s important for manufacturers to ask themselves which test placebo is most relevant to the real-life API eventually to be used and has each supplier tested with the same placebo? Ensuring these points are both covered will result in a much more tangible and comparable analysis in the end. Moving on to the matter of statistical analysis, it is surprising that in an industry where statistics are so important, there is so much variation permitted. Manufacturers often review the data following this SMEPAC laboratory test and use it to qualify the choice of containment controls for their required process. However, comparing these tests on a like for like basis could prove to misrepresent its performance from its final working environment. There are so many variations in the way the containment performance tests are carried out and as discussed above, the interpretation and utilization of the results obtained can be inconsistent. There is therefore a real risk for manufacturers to presume that performance will be identical, whether it’s in the laboratory test or in the real manufacturing environment? That said, in a risk-based era, it’s important to consider all variables and examine how these could lead to issues, if not addressed earlier in the qualification process. 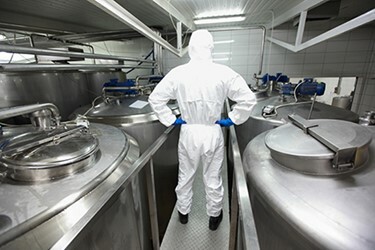 Reducing the need for operator intervention and limiting contamination is a priority during high potency manufacturing. Operator intervention is present throughout most of the pharmaceutical manufacturing process so it’s essential that manufacturers ensure that there are controls in place to counter the possible hazards. However, it goes without saying that these solutions need to be reached without impacting on ergonomics and productivity. Finding the most appropriate solution can therefore be a challenge and qualification testing needs to reflect these challenges. Verification of the containment performance should also be implemented at each stage where possible exposure could be present within its normal environment. For example, a charging application that has not undergone contained dispensing operation prior to being within the test environment, cannot be compared like-for-like to its real working application within its manufacturing setting. The state of the device, for example, the identification and rectification of any damage, introduces further risk and should be questioned during this qualification process. Frequent observation and precautionary maintenance helps to protect the reliability of the containment solution and limiting operator intervention will also help to maintain a more reliable result. The presence of SBVs has helped to address the more rigorous containment challenges when handling potent compounds and removes the risk of airborne exposure. Capable of integration with other containment systems, SBVs allow for a much quicker transfer of potent compounds and can be implemented in other applications where dust restrictions, product flow, yield and contamination are factors. Commonly, containment performance has mostly been perceived as being directly associated to the levels of particle residue visible after separation of the containment device, but tests have proven that this is not the case. As extraction methods have developed, it has led to the recovery of potentially airborne particles, which greatly reduces the level of visible particles. This offers an exceptional, robust answer to realizing repeatable operation. Double gloving, rigorous wiping procedures and waste disposal are all proven to reduce exposure but by further reducing operator intervention by introducing automation, could there be potential to reduce risk even more? Smart machines and sensor technologies have been talked about a lot recently in the era of industry 4.0. With the pressures that exist within production, managing the ongoing risks associated with Industrial Hygiene and Quality can be challenging. By incorporating smart monitoring technology into SBVs, it could provide the power to control risk and improve productivity as part of a transfer system that continuously records usage data and delivers alerts back to the team. The technology can provide operators with visual, real-time feedback giving them, as well as quality teams, confidence and peace of mind. If the health of the device is at risk, the smart technology creates alerts to ensure that maintenance can take proactive action to maintain system integrity, resulting in less downtime and improved productivity. Such technologies will add a new dimension to traditional containment strategies, allowing manufacturers to adhere to their most rigorous regulatory responsibilities in the most efficient way possible. With the ability to closer monitor the sterile health characteristics that influence performance, they offer manufactures a hugely improved process and provide ongoing monitoring. There are many considerations for manufacturers when it comes to containment testing. Due to the notable differences that exist between laboratory and real manufacturing environments, it is imperative to appreciate the potential boundaries of the SMEPAC guideline, as this is based on a laboratory test. However, as the industry continues to forge ahead with technological developments, like smart monitoring to capture more repeatable and consistent data, is there an opportunity for the industry to improve containment performance and qualification testing, and maybe eventually adopt a new test, in place of a single laboratory test?